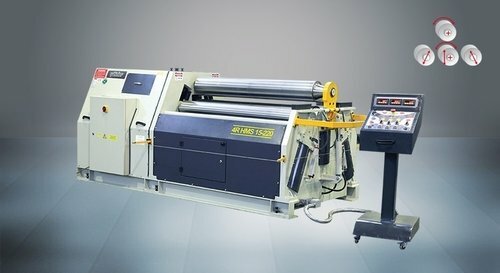 Looking for a USED 4R HMS 1050X80? As the leading manufacturer in the world for Plate Bending Machines, Profile Bending Machines and Ironworkers , our Catalogues brings together all our products under one catalogue for easy reference. With new products under our production programme such as Elliptical Cutting - Flanging Machine, Cutting/Flanging Machines and Dish-End Making Machines and new 175 Ton Ironworker we aim to cover all the needs of our customers in all sheet metal related industries such as steel construction, fabrication, pressure vessels, food processing tanks, advertising towers, metal furniture, automotive, aerospace, ship building, forming. Also our range of 4R HSS Plate Bending Rolls have been improved to meet demands of new Wind Tower Sector. We can offer single machines to complete lines for production of Wind Tower Plants. Contact us for single machine needs or turnkey projects. 283 ModelsView more about Sahinler Metal Makina Endüstri A.Ş. Looking to Purchase a New SAHINLER 4R HMS 1050X80? Grupo Comercial Dadasi, S.A. de C.V.
Isıtan Makina Sanayi Tic. Ltd. Şti.